My first Cat Postcard Swap on Swap-Bot was such a hit that I've immediately started two more. 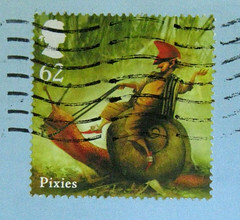 (I know, some of you must be sick of hearing about this...) This time, by popular demand, I separated it into two swaps: one USA only swap for those of you that live in the USA and don't want to pay international postage, and one International swap open to any country. If you're in the USA and want to join both, go for it! For both the International and the USA-only swaps, the deadline to sign up is next Sunday, November 29. I'll assign partners Monday, November 30, and postcards must be sent by Monday, December 7. Each swap has two partners, and the rules are the same as last time - you need to write something about a cat or cats on the back of the postcard. I must ask, WHERE did you get that great postcard? My brother is a cat fanatic, doesn't write much and this would be a great gift..are they still available? 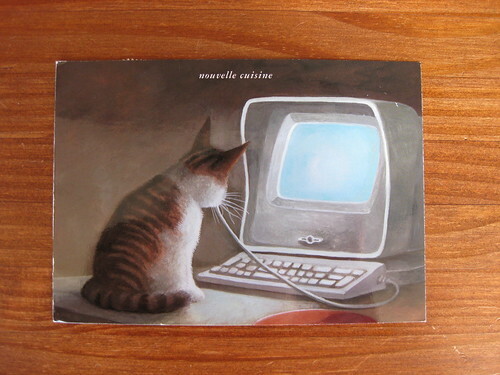 I didn't buy this postcard, someone sent it to me via Sendsomething. But I blogged about it originally last March, and noted then that it was made by the German company inkognito. (They have awesome postcards.) If you google that, you might have some luck. Or, even better, here is a link to that postcard on inkognito. Of course the company is German and it's priced in Euros.